“Today it is particularly senseless that the meaning of war and its horror–as well, obviously, as its terror–should still be entrusted to the perspective of the warrior….The civilian victims, of whom the numbers of dead have soared from the Second World War on, do not share the desire to kill, much less the desire to get killed” (65). “the instant of time that blows the bodies of the ‘human bombs’ and their victims to pieces today annuls the dimension of time: time in which to face up to the reality of one’s own crime and to answer for it singularly. Closed in on itself, suicidal horrorism thus takes pride in the unappealability of its work in the service of an instantaneous and irresponsible violence. 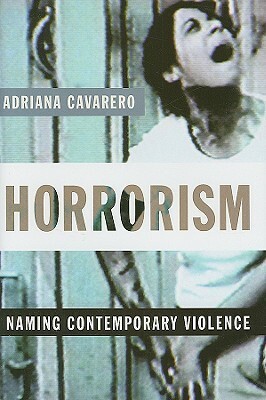 In this sense, it is no surprise that books on female suicide bombings written by women who are disposed to understand them, if not justify and sympathize with them, have a tendency to minimize the ethical responsibility of the bombers” (103) I think other people are likely to to get a lot more out of this book than I did. Adriana Cavarero rightly demands that we should try to apprehend violence from the perspective not of the warrior (or ‘terrorist’) but from that of the victim. The victim, we should presume, does not care about whether or not he or she is being mutilated, tortured, or killed by a state actor, a criminal, or suicide bomber. Nor does the victim care about the motivation of the agent of violence: here’s she might have used one of Zizek’s favorite quotes, this from Deleuze: “si vous êtes pris dans le rêve de l’autre, vous êtes foutu!”, since these dreams of the other, dreams whether for ‘freedom and democracy’ or for the Caliphate or whatever, do not matter to the victim. What matters is the pain and death, especially when the victim, caught unawares, has been unable to defend him or herself from the violence. This latter point, too, is key to Cavarero, as she observes that what distinguishes modern warfare from Homeric violence (her paradigm) is the particular suffering of the defenseless. Not the battlefield, but the bombed out city, or marketplace, or supermarket, or the theater filled with corpses and poison gas, is the picture of modern mass violence. For those interested in a richer philosophy and politics of war, for those interested in engaging in further debates with Bataille (she’s against him), Arendt (largely for), suicide bombing (particularly when committed by women), and contemporary modes of violence, I imagine this book is indispensable. But it absolutely needs to be paired with Zizek’s Violence: Six Sideways Reflections, in large part because Cavarero never considers the systemic violence of global capitalism itself. To use Zizek’s terminology, she is so committed to studying subjective violence that–symptomatically–she does not see the system of violence that sustains her own way of life. We might save Cavarero’s analysis by imagining what a ‘horroristic’ study might make of the fancy widget-maker (fwm): does the fwm care whether or not she is making a fw for the international yuppie smart set? Would it be all the same to her if she were manufacturing, say, toilet plungers? I suspect so. Cavarero demands that warriors and terrorists alike try to understand the violence they commit from the perspective of the victim. What might happen to our (where our= “the international yuppie smart set”) love of our fw when we try to apprehend it from the perspective of the worker? Alternately, in my own work, I may demand that we try to understand nonhuman death from the perspective of the nonhuman. What does the cow care whether its meat is properly cooked? What does the sheep care whether its skin will be used for Chaucer or, god help it, Lydgate? Cavarero could ask such questions, but she is relentlessly and unthinkingly anthropocentric, a stance that is becoming increasingly unforgivable for any critical theorist given the growing body of critical animal theory. However, when she writes, “Horror has to do precisely with the killing of uniqueness….it consists in an attack on the ontological material that, transforming unique beings into a mass of superfluous beings whose ‘murder is as impersonal as the squashing of a gnat’ [qting Arendt Origins of Totalitarianism:], also takes away from them their own death” (43), this surely applies as much to animals, medieval or modern, as it does to the human animal caught up in some totalitarian fantasy. I have to confess to a perhaps petty annoyance with her typical litany of historical horrors: Stalinist Ukraine, Maoist China, Palestine and Israel, Iraq, Guernica, the Khmer Rouge, Chechnya, Rwanda, German and Japanese firebombed (& otherwise) cities, Nanking, the Holocaust, Armenia (with a few scattered references to Italian cases). There’s no evidence that she considered why this representative litany occurred to her and not, say, the Congo of King Leopold or the DR Congo of the twenty-first century: my sense is that consideration of these other African killing fields would require an analysis of her own complicity as a citizen of a wealthy European nation. I suffer an even pettier annoyance when she writes: “Any review of the refined arts of war developed over the course of the century would have to dedicate a separate chapter to the aerial bombardments inaugurated by German forces over Guernica and Coventry” (51). Why not Italian forces over Ethiopia in the year before Guernica, or, arguably, RAF forces over Sulaymaniyah? (and while it’s tempting to suggest the Zeppelin raids of English, beginning in 1915, the difference between these and Sulaymaniyah, Ethiopia, or Guernica is that the English could defend themselves: the Kurds, Ethiopians, and Basques could not, and thus stand as better representatives of horrorism (unlike the inhabitants of Coventry)). And perhaps pettiest of all: her moments of sloppiness, e.g., “…in this massacre there are not even innocents anymore, given that, whoever they are, each one is as good as the next in the abstract role of example. Although called infidel or miscreant, the absolute enemy loses all quality and assumes the role of anyone at all, with respect to whom the eventual faith of every singular victim–who sometimes, and certainly in modern Iraq, believes in the same god as his murderers–is just an accident” (75). Good point on the purposeful randomness of the victims of modern mass violence, but, c’mon, this not only elides the religious differences between Sunni and Shia, it also elides the fact that Christians, Jews, and Muslims all worship the same God! Sheesh. Just like Catholics and Protestants, who have gotten along, as we know, famously well.